After much speculation, the name of Kylie Jenner‘s newborn has been revealed! Much like Kim Kardashian‘s North, Saint, and Chicago West and Rob Kardashian‘s Dream Kardashian, the baby girl’s moniker is unique as ever. Though some fans presumed that the 20-year-old reality star and Travis Scott named their first child Butterfly, a creature of significant meaning to the couple, it seems the new parents have taken a different approach. Read on to see what they actually named her! Fans didn’t have to wait long to find out the name of Kylie Jenner‘s new baby girl. Just days after she gave birth to her first child, and subsequently confirmed her hush-hush pregnancy after more than nine months of silence, the 20-year-old reality star took to Instagram to reveal her daughter’s unique moniker. 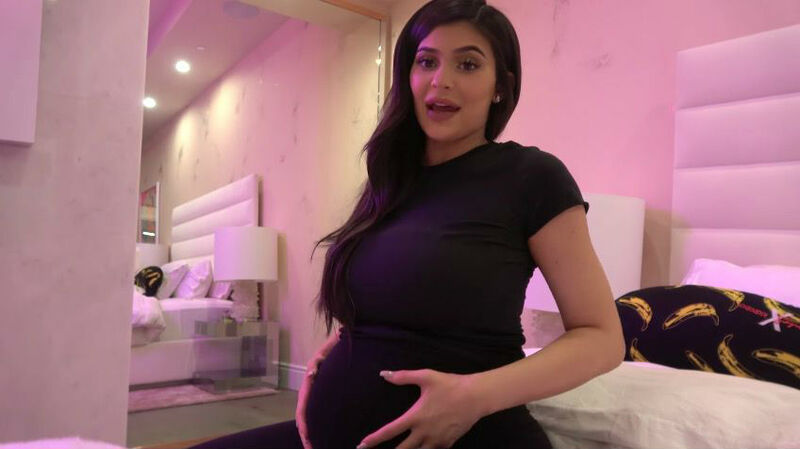 Sharing a never-before-seen shot of the newborn, the Kylie Cosmetics founder announced that she had named her little one Stormi. Kylie captioned the sweet mother-and-daughter — which showed the tiny tot clutching the new mom’s perfectly pink manicure — with the name and an angel emoji. Stormi now joins cousins North, Saint, and Chicago West, as well as Dream Kardashian and Reign Disick as members of the Keeping Up with the Kardashians clan with uncommon names. As previously reported, many fans speculated the makeup mogul had named her bundle of joy “Butterfly”, a symbol of significant meaning to the starlet and boyfriend Travis Scott, 25, since they previously got matching tattoos of the winged creature. The name Posie was also a frontrunner for loyal followers as a special version of Kylie’s lip kit of the same name was released on the baby’s birthday. However, according to the first-time mom herself, she had already picked out the name way before the arrival of her child. Even before news of her pregnancy got out, the Life of Kylie star revealed on her app that she already had a list of baby names chosen for her brood. Earlier this week, Kylie confirmed she gave birth and apologized to fans for keeping them in the dark about the baby news. What do you think of the name Stormi? Sound off in the comments and SHARE story!